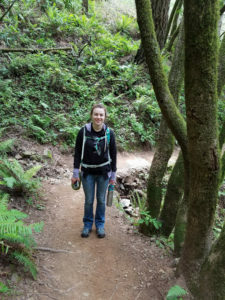 Depending on the duration and difficulty of your hike, you’ll want to consider two different types of hiking snacks: slow burning energy and quick energy snacks. Slow burning energy snacks for hiking consist of carbohydrate, fiber and protein. This type of snack will help to curb your hunger for a several hours as well as help you achieve your daily calorie, carbohydrate and protein goals. 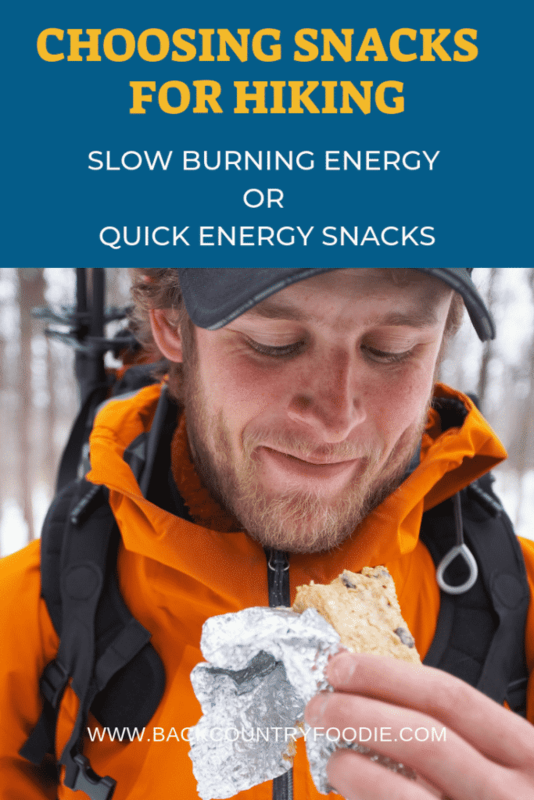 Quick energy snacks for hiking will help prevent you from “hitting the wall”, “bonking”, or “crashing”. Most hikers have experienced this at some point in their hiking careers and it’s not a pleasant experience. These snacks provide a source of simple carbohydrates (i.e. sugar) and can oftentimes contain electrolytes. Quick energy snacks help you continue at optimal performance while maintaining blood sugars for hikes greater than one hour. Note: Be aware that some quick energy snacks contain caffeine. It is up to the individual to determine if caffeine is beneficial while hiking. Personally, I like to bring a combination of snacks from both the long burning energy and quick energy snack options listed above. For times when I do not plan on stopping to eat a meal, I may grab an energy chew or fruit snack that I can easily consume while hiking. I typically bring a bar, trail mix and a sandwich for longer hikes when we do plan on making a few stops. Additionally, consider the amount of space you have when packing a snack. Storage space available may also play a role in which snacks to bring as well as the quantity. To determine which snacks fuel your body best while hiking, try different snacks on various hikes to see how your body feels after consuming each snack. 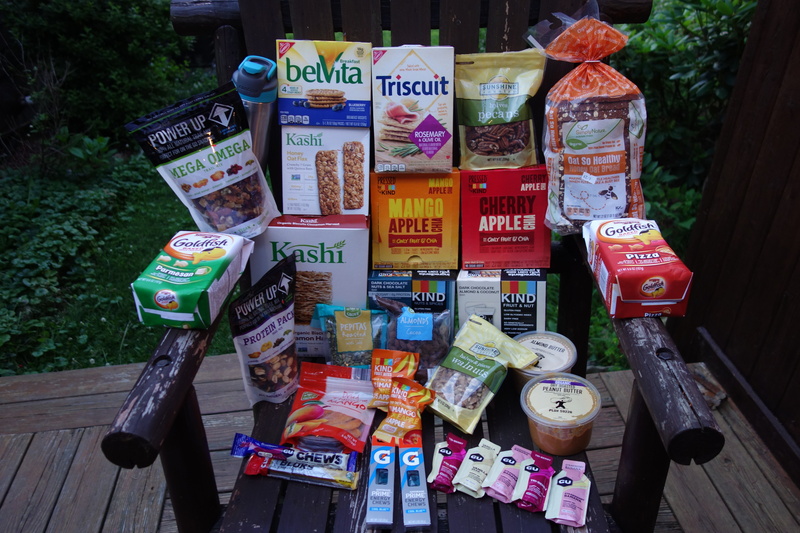 The type and duration of the hike will help you decide which snacks to choose. Proper hydration while hiking is just as important as consuming proper snacks. I always carry a water bottle, hydration bladder such as a Camelbak, or both with me depending on how long I’ll be out. Check out dietitian Marisa Michael’s post about hydration at altitude and dietitian Briana Bruinoodge’s post about what to drink in hot weather for additional tips for staying hydrated. Here are a few more posts that you might find helpful while preparing for hiking adventures. Kim Pierce, MS, RD, LDN, CDE, The Outdoors Dietitian, is a registered dietitian and certified diabetes educator in Northeast Ohio and Western Pennsylvania. She counsels individuals and athletes on proper nutrition to fuel their bodies for outdoor activities. Kim is a lifelong ice hockey player, cyclist, hiker, and lover of the outdoors. You can follow Kim on Instagram, Facebook and Twitter at Outdoors Dietitian.